When I chose steampunk as a research topic for my dissertation, I did it out of a mix of curiosity and pragmatism. My curiosity stemmed from having read Steffen Hantke's seminal article on steampunk, "Difference Engines and Other Infernal Devices: History According to Steampunk." I knew more steampunk had been released since 1999, and was curious to read some. My pragmatism was related both to finding a subject I could abide digging through for 4-6 years, and having a supervisor I got along with. My thesis supervisor on my M.A. thesis helped me cast the deciding vote toward steampunk when she told me she'd love to be my graduate advisor if I chose steampunk as my topic. What I didn't anticipate was how my research of steampunk would coincide with the stories and films I loved as kid: Verne's 20,000 Leagues Under the Sea and it's Disney adaptation; movies like Warlords of Atlantis, which I saw at Saturday matinees in the days before VCRs obliterated such re-showings on the big screen; and the blend of high-adventure elements which were the space of my childhood daydreams - airships, steam-trains, pirates, heroes, and while not as often, still present on occasion - dinosaurs. Both my children love dinosaurs. We recently got to enjoy a trip to the Calgary Zoo by the good graces of fellow blogger Cory Gross to see the animatronic dinosaurs newly on display. 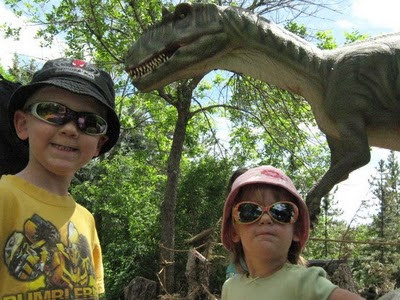 Edmonton recently got its own animatronic dinosaur farm just north of the city, and my son can't wait to go. When I was a teaching assistant in an elementary school, I noted how little the fascination with dinosaurs has waned with that age group. I'm not sure what draws children to the terrible lizards, but given that my kids fight over who is the T-Rex (and one of them is a 2-year old girl who loves pink and princesses), they find the lure of dinosaurs irresistable. 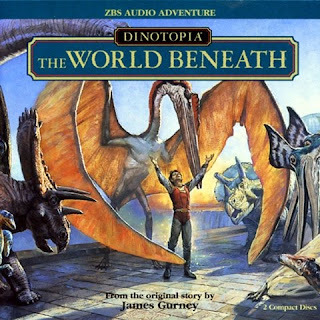 ZBS Foundation's audio adaptation of Dinotopia: The World Beneath is targeted at children, and those who are still children at heart. Instead of being taken back to books I've read, I was immersed in memories of my days of listening to Power Records' 45s back in the 80s (and if you don't know what those are, you're too young to think it's cool - The Monster of Frankenstein remains a favorite for me): I used to check out LPs from our public library of old radio dramas, and produced my own with my dad's mixing board and tape decks. I even volunteered for a stint as a Bajoran on Pendant Productions' Star Trek homage, Defiant. I love dramatized books, and from a production angle, ZBS has done a fantastic job with Dinotopia: The World Beneath. I'm betraying a certain bias here, in the age of interactive media and DVD systems in family vehicles (for the record, we have one, and it's a blessing on long trips). I guess I value hearing stories read: I read stories to my children every night (studies have shown this helps them with literacy in later years, if for no other reason than to give them an appreciation for books), and they listen to stories while they fall asleep: audiobooks ranging from Clifford, the Big Red Dog to How to Train Your Dragon. While I love to watch movies, I equally love a good audiobook, and listen to them on my cycling commute. I got through Dinotopia: The World Beneath in the space of two days' cycling, and while I had to gear down my brain into kid-mode to really appreciate the story (there are some jokes that are groan-worthy, and the romantic elements were cliche), it was a return to those days of my youth, when dinosaurs, submarines, and lost treasure all shared the same narrative habitus. For those who are interested in its steampunk factor, Dinotopia: The World Beneath fits my definition of technofantasies in a neo-Victorian retrofuture very well, right down to the sun-stones, the magical power-source needed for the automaton dinosaurs to work (I could actually cite two different lengthy conversations in the book that play into the science vs. faith / reason vs. magic aspect of steampunk). 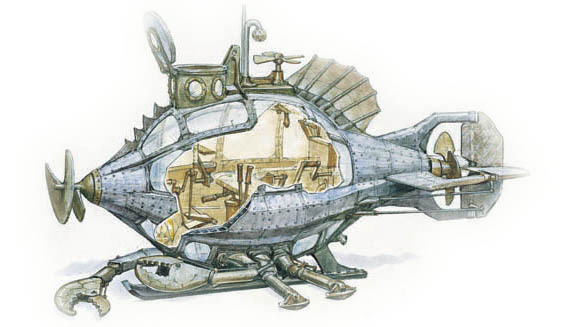 There's a steam-powered "dragoncopter," and a pedal-powered submersible as well. Gurney's story is a mash-up of many tried and true adventure elements, so there aren't any real surprises for adults - for us, there's a walk down the memory lane of Raiders of the Lost Ark, Atlantis: The Lost Empire, those matinees of yore, and the days of playing in the backyard on a summer's day with plastic dinosaurs in hand. As an audiobook though, Dinotopia: The World Beneath, while a great adventure story with a fast pace, is a bit of mixed bag for me, and that's not due to the technical brilliance of ZBS Foundation's audio production. The actors are all quite capable (I loved the actress who voiced Oriana Nascava - I need to find more books with her voice, which could melt butter), and the sound effects and music are great. However, as the frame narrative reveals, this is an account of Professor Arthur Denison's adventures related both through notes and sketchbook. 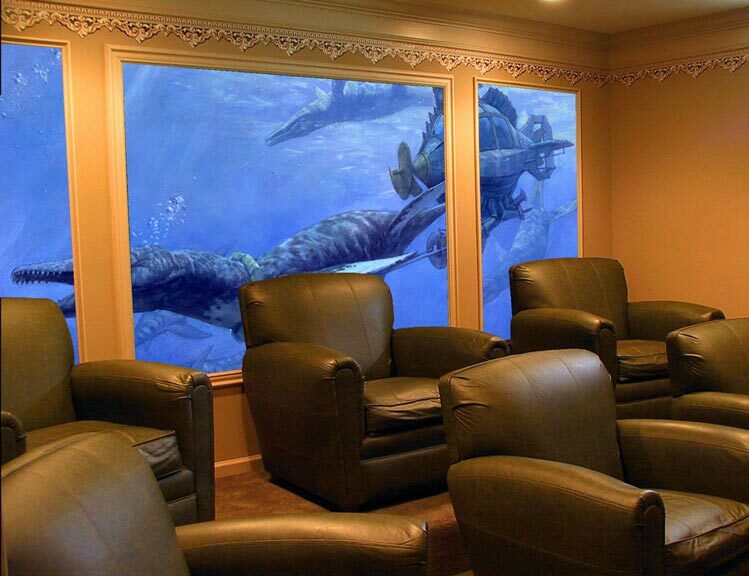 There were a number of moments while listening to the audio that I felt the lack of James Gurney's amazing artwork - Gurney's a far better artist than writer, and a good audio program relies on different storytelling devices than a picture book does. To get an idea of what I mean, check out the promo video from ZBS Foundation. I'm not sure what sort of encoding would be necessary, but if there's a way to make the pictures associated with an audio file change with chapters, this would be the way to go, or at the least include the images from Gurney's book as an additional download. Being able to scroll through those images while listening would make a great difference to the enjoyment of this particular audiobook. 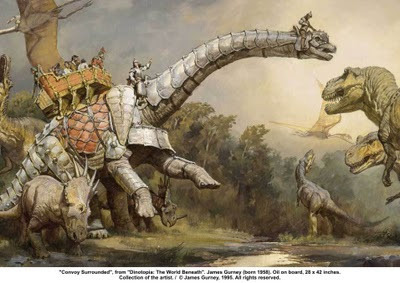 But rather than read this as a reason to avoid getting Dinotopia: The World Beneath as audio, simply see it as an encouragement to make sure you track down a copy of Gurney's book and it's phenomenal illustrations. Imagine taking that vacation with the audio for the drive and the book for the hotel or campground. I know I'll be doing as much in a few years when my kids are ready for such a journey. Gurney Journey - James Gurney's way-cool blog with tips for painters and illustrators! A Steampunk State of Mind, another steampunk audio-adventure from ZBS Foundation with free downloads for the first chapters! I love and adore this book, and it has given me so much inspiration through the creativity of Gurney's world. I have to second that, whatever merits the audiobook has, you really do need Gurney's visuals to fill it out. It also helps to read the main part of the series together to get a full apreciation... "Dinotopia: A Land Apart from Time", "Dinotopia: The World Beneath", and most recently "Dinotopia: Journey to Chandara" (which I'm still working on). I remember reading an interview with Gurney where he was asked about his influences. He noted that people kept approaching him to say that his work was so much like that of Verne and Conan Doyle, but that he himself was influenced by the journals of actual explorers like Burton, Wallace, Darwin and co. That's fantastic and shows. He gets right back to the real deep roots of the genre and comes up with a beautiful Scientific Romance that bypasses simple pastiche. Also: Edmonton has an animatronic dinosaur park of its own?! Sounds like time for a field trip! You can get the first book in the series on audio from ZBS Foundation, so I'm guessing they'll go the distance and do them all. And I agree that Gurney definitely produces a great VSF, which is why the miniseries was so lamentable in its updating the time-period. Dinotopia fits in the era of exploration when there were still corners of the world we hadn't reached. Let me know if you do that dino-field trip Cory - we'll do food again! Listening to Dinotopia is like watching MTV on mute.